Keith entered the Workforce Innovation and Opportunity Act (WIOA) program in March of 2017 seeking assistance with obtaining his GED. His hard work and determination paid off. He obtained a Silver WorkKeys certificate and his GED by May of 2017 while attending the Anderson Adult Education Center. Keith’s educational goals didn’t end with his GED though. He and his career coach discussed options for further training, specifically centered around the manufacturing industry. He started training at Tri-County Technical College (TCTC) in the South Carolina Manufacturing Certification (SCMC) training course. After finishing the SCMC Certification, Keith began working full-time at Magna in mid-August as a CNC Operator, and realized that he would like to continue on and get his CNC Operator certification. With assistance from TCTC and WIOA, Keith was able to start the CNC class in early October. He is currently attending this class and working full-time. WIOA has been a big help for Keith! 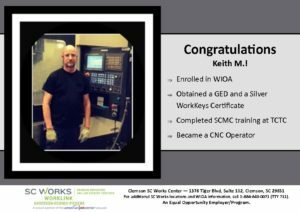 Because Keith came through SCWorks and an approved WIOA Training Provider, Tri-County Technical College, he can say, “I’m the next one!” Congratulations, Keith, on being the next one employed, the next one with a CNC Certification, SCMC Certification, a GED, and a WorkKeys Silver Certificate, and the next one to achieve your dreams! To find out more about career pathways and how the SC Works WorkLink WIOA program can help you achieve success, call Steve at 1-864-643-0071 (TTY 711).